A powerful ocean storm has killed at least 11 people and forced the closure of one of Japan’s busiest airports. Typhoon Jebi struck Japan’s western island of Shikoku on Tuesday. With continuous winds of 160 kilometers an hour, it was the strongest storm to hit Japan since 1993. Boats rescued about 3,000 people who could not leave Kansai International Airport. 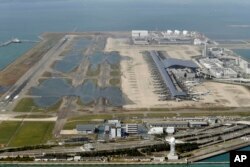 The airport is built on a man-made island in Osaka Bay. Passengers who were trapped in the airport overnight said there was no electricity, food or wireless service. 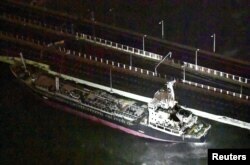 The island was cut off when a large ship crashed into and badly damaged a bridge between the airport and the mainland. Runways at the airport were largely underwater after the storm struck Tuesday. Officials say they do not know when the airport will reopen. Kansai is an important airport for visitors to Osaka, Kyoto and Kobe. It also is a center for the transportation of computer chips, electronics and other exports. 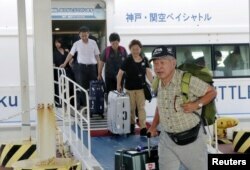 Chief Cabinet Secretary Yoshihide Suga said on Wednesday that about 470 people had been hurt in the storm. Kansai Electric Power Company said that more than 400,000 people were without electricity. Businesses with factories in the area include Daihatsu Motor Company, Panasonic and drink-maker Kirin. The factories closed because of the storm but were expected to re-open on Wednesday. The powerful typhoon comes after heavy rains caused floods in central and western Japan in July. More than 200 people were killed. Japanese Prime Minister Shinzo Abe was criticized for his government’s reaction to the floods. The Japanese leader cancelled a planned trip to Kyushu to deal with the typhoon. Mario Ritter adapted this story for VOA Learning English with additional material from AP. Caty Weaver was the editor.